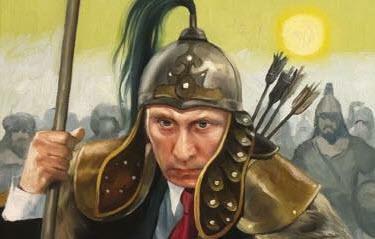 An illustration from a Wall Street Journal article entitled “Russia’s Turn to its Asian Past” depicting Vladimir Putin as Genghis Khan. His seminal text forever reoriented political discourse by painstakingly examining the overlooked cultural imperialism of colonial history in the West’s construction of the so-called Orient. Said meticulously interrogated the Other-ing of the non-Western world in the humanities, arts, and anthropology down to its minutiae. As a result, the West was forced to confront not just its economic and political plunder but the long-established cultural biases filtering the lens through which it viewed the East which shaped its dominion over it. His writings proved to be so influential that they laid the foundations for what is now known as post-colonial theory. This became an ironic category as the author himself would strongly reject any implication that the subjugation of developing countries is a thing of the past. How apropos that the Mandatory Palestine-born writer’s death came in the midst of the early stages of the ‘War on Terror’ that made clear Western imperialism is very much alive. Despite its history of ethnic cleansing, slavery, and war, the United States had distinguished itself from Britain and France in that it had never established its own major colonies within the Middle East, Asia or North Africa in the heart of the Orient. According to Said, it was now undergoing this venture as the world’s sole remaining superpower following the end of the Cold War with the invasions of Afghanistan and Iraq. If a comparison between the 2001 attacks that killed nearly 3,000 Americans and the still unproven allegations of Russian meddling seems outrageous, it is precisely such an analogy that has been made by Russiagate’s own biggest proponents, from neoconservative columnist Max Boot to Hillary Clinton herself. Truthfully, it is the climate of hysteria and dumbing down of discourse to such rigid dichotomies following both events where a real similarity can be drawn. The ‘with us or against us’ chasm that followed 9/11 has reemerged in the ‘either/or’ post-election polarity of the Trump era whereby all debate within the Overton window is pigeonholed into a ‘pro vs. anti-Trump’ or ‘pro vs. anti-Russia’ false dilemma. It is even perpetrated by some on the far left, e.g. if one critiques corporate media or Russiagate, they are grouped as ‘pro-Trump’ or ‘pro-Putin’ no matter their political orientation. This dangerous atmosphere is feeding an unprecedented wave of censorship of dissenting voices across the spectrum. In his final years, not only did Edward Said condemn the Bush administration but highlighted how corporate media was using bigoted tropes in its representations of Arabs and Muslims to justify U.S. foreign policy. Even though it has gone mostly undetected, the neo-McCarthyist frenzy following the election has produced a similar travesty of caricatures depicting Russia and Vladimir Putin. One such egregious example was a July 2018 article in the Wall Street Journal entitled “Russia’s Turn to Its Asian Past” featuring an illustration portraying Vladimir Putin as Genghis Khan. The racist image and headline suggested that Russia is somehow inherently autocratic because of its past occupation under the Mongol Empire during its conquest of Eastern Europe and the Kievan Rus state in the 13th century. In a conceptual revival of the Eurocentric trope of Asiatic or Oriental despotism, the hint is that past race-mixing is where Russia inherited this tyrannical trait. 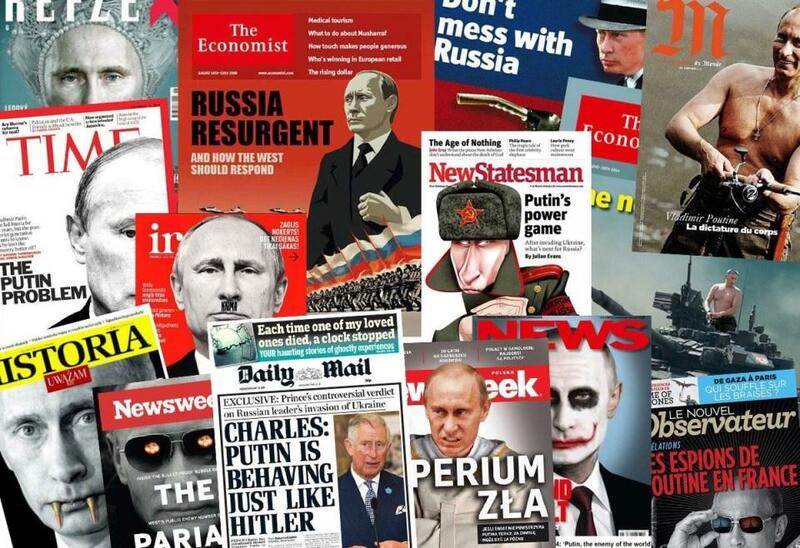 When the cover story appeared, there was virtually no outcry due to the post-election delirium and everyday fear-mongering about Russia that is now commonplace in the media. In fact, liberals have seemingly abandoned their supposed progressive credence across the board while suffering from their anti-Russia neurological disorder. In an exemplar of yellow journalism, outlets like NBC News published sensational articles alleging that because of the perceived ingratiation between Trump and Putin, there was an increase in Russian ‘birth tourism’ in the United States. More commonly known by the pejorative ‘anchor babies’, birth tourism is the false claim that many immigrants travel to countries for the purpose of having children in order to obtain citizenship. While there may be individual cases, the idea that it is an epidemic is a complete myth — the vast majority of immigration is motivated by labor demands and changes in political or socio-economic factors in their native countries, whether it is from the global south or Eastern Europe. Trump has been rightfully criticized for promoting this falsehood regarding undocumented immigrants and his executive orders targeting birthright citizenship, but it appears liberals are willing to unfairly apply this same fallacy toward Russians for political reasons. In order to make sense of the current groupthink hysteria towards Moscow, it must be understood in its context as an extension of the ongoing doctoring of history regarding U.S.-Russia relations since the Cold War. Americans living within the empire are proselytized into a glorified and nationalist version of their entire background, beginning with merchants and explorers ‘discovering’ the continent and the whitewashing of indigenous genocide. This imaginary narrative includes the version of WWII taught in U.S. schools and the arms race with the Soviet Union that followed. The West presents an entirely Anglospheric perspective of the war starting with its very chronology. For example, it is said that the conflict ‘officially’ began with the September 1st, 1939 invasion of Poland by Nazi Germany. This mythology immediately frames the war from an Eurocentric viewpoint by separating the Sino-Japanese war that was already underway as the Pacific Ocean theater began long before the ‘surprise’ Japanese attack on Pearl Harbor in 1941 and U.S. entry into the conflict. The truth is that nearly everything Americans are taught about U.S. participation in the war is either a mischaracterization or a lie, with its role in the Allied victory inflated exponentially. The widely held misconception that the 1944 Normandy landings in the Allied invasion of France was the decisive turning point in Europe is a fairy tale. The ‘D’ in D-Day does not stand for ‘decision’ as many Westerners assume, and when the Allied forces converged on Germany from East and West it was the Soviets who captured Berlin. Although Operation Overlord may have been the largest invasion transported by sea in history, the real watershed in the Great Patriotic War was the Soviet victory in the Battle of Stalingrad the previous year, the biggest defeat ever suffered by the German army. The U.S. only took on the Wehrmacht once it was exhausted by the Red Army which bore the real burden of overcoming Germany. The Germans did not hold the same hatred for the West that it reserved for the Russians. In fact, the Führer personally admired the U.S. so much for the extermination of its natives that he named his armored private train ‘Amerika’, a mobile version of the Wolf’s Lair. The Nuremberg race statutes were partly inspired by Jim Crow segregation laws in the U.S. and many of the defendants at the Nuremberg trials tried to excuse their atrocities by arguing the similarity between Nazi race theories and the eugenicist movement which actually originated in the United States. Auschwitz physician Josef Mengele was even previously employed as an assistant to the head of the Kaiser Wilhelm Institute of Anthropology, Human Heredity, and Eugenics institute that was funded by the Rockefeller Foundation. Hitler also preferred an attack on the Soviets over an invasion of Britain because of the eugenics of Lebensraum. Nazi Germany, like Britain and France, was really an imperial settler colonialist state and Hitler viewed the Slav inhabitants of the USSR as ethnically inferior to the ‘master race.’ The Molotov-Ribbentrop pact had been a strategic move to buy time for the Soviets in preparation for a German onslaught, at the time the most powerful military power in the world. Britain and France had rebuffed Stalin’s efforts to form an alliance in 1938, leaving the USSR no choice but to sign a non-aggression pact with Germany, knowing full well it was only a matter of time until Hitler would eventually embark on his Masterplan for the East. Operation Barbarossa, in June 1941, broke the agreement and the German dictator ultimately sealed his own fate. Although the Soviets were victorious, the slaughter that proceeded it had no parallel in human history as 27 million citizens would lose their lives in the fight compared to less than half a million Americans. Even worse, the West has made a mockery of this sacrifice with their refusal to fully acknowledge the USSR’s contribution despite the fact that they did the vast majority of the fighting and dying while 80% of all German casualties were on the Eastern Front. Meanwhile, the Cold War had already begun before the Second World War even ended. Whether or not Stalin was fully aware of either the U.S. capability or plans to use the atomic bomb against Japan is still a matter of debate, as U.S. President Harry S. Truman changed his story numerous times over the years. Nevertheless, their use is incorrectly attributed by the West to have brought the war’s end and very few Americans realize this tale was told entirely for political reasons. The purported rationale was to allegedly save the lives of American soldiers that would be lost in a future Allied invasion of Japan planned for the Autumn of 1945. Controlling the narrative became crucial in ‘justifying’ the use of such deadly weapons which held the secret motivation to begin an arms race with the Soviets. Stalin and U.S. President Franklin D. Roosevelt had agreed at the Yalta Conference in February 1945 that the USSR would eventually break its neutrality treaty with Japan and enter the Pacific theater later in the year. That was until Roosevelt died of a massive cerebral hemorrhage just a few months later while American nuclear physicists were busy at work enriching uranium in Los Alamos, New Mexico. Then, just a day prior to newly inaugurated President Truman’s meeting with Stalin at the Potsdam Conference in July, the U.S. army and Project Y successfully detonated a nuclear weapon for the first time with the Trinity test as part of the expensive Manhattan Project. After his face-to-face with Truman at Potsdam, whom everyone agrees at least hinted to Stalin of the new U.S. weaponry, the Soviet premier suspected the new U.S. leader would go back on the previous agreement at Yalta with Roosevelt that included compromises with the USSR in the Pacific. The ugly truth is that the U.S. was well aware that the Japanese were willing to conditionally surrender on the basis of immunity for Emperor Hirohito. However, the U.S. secretly wanted to achieve an Allied victory ideally without Soviet participation so it could demonstrate its exclusive nuclear capability in order to dominate the post-war order. Japan didn’t relinquish following the first bombing of Hiroshima but the second, Nagasaki, three days later — both of which mostly impacted civilians, not its military. What else happened on August 9th, 1945? The Soviet Union declared war on Japan upon realizing that the U.S. was backtracking on its pledge with the underhanded use of ‘Fat Man and Little Boy’ that instantly killed more than 200,000 civilians. The timing gave the appearance that the bomb resulted in the surrender when it was the Soviet invasion of occupied Manchuria in the north against Japan’s military stronghold that was the real tipping point which led to an unconditional acceptance of defeat. 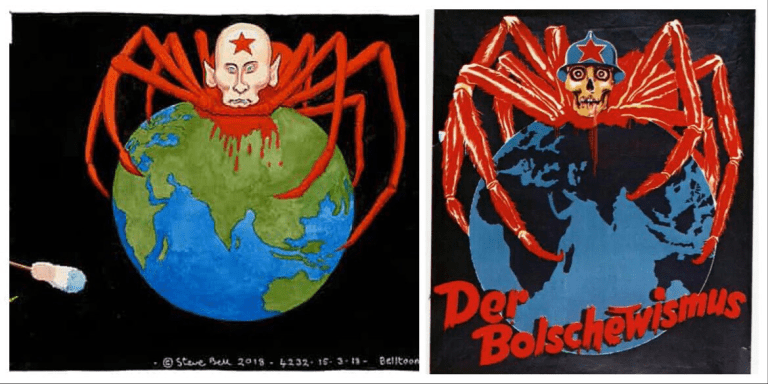 Is it any wonder that British newspaper The Guardian is now illustrating cartoons in its anti-Russia propaganda today that imitate Goebbels’ anti-Soviet posters during WWII? A point to be noted is that in this respect Mr. Churchill and his friends bear a striking resemblance to Hitler and his friends. Hitler began his work of unleashing war by proclaiming a race theory, declaring that only German-speaking people constituted a superior nation. 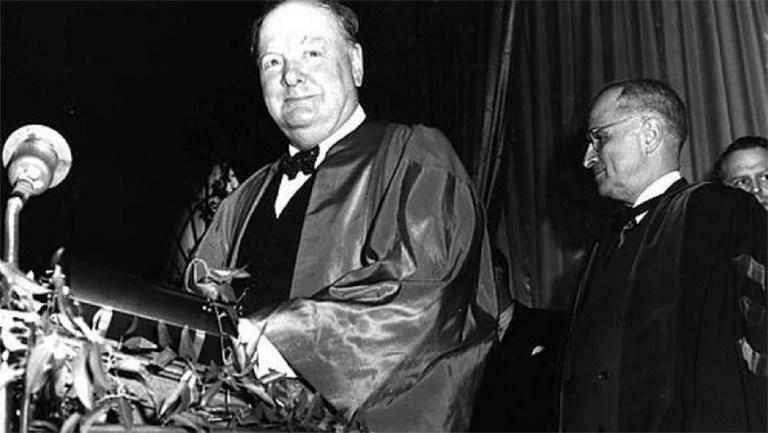 Mr. Churchill sets out to unleash war with a race theory, asserting that only English-speaking nations are superior nations, who are called upon to decide the destinies of the entire world. The German race theory led Hitler and his friends to the conclusion that the Germans, as the only superior nation, should rule over other nations. The English race theory leads Mr. Churchill and his friends to the conclusion that the English-speaking nations, as the only superior nations, should rule over the rest of the nations of the world. Yet who foremost ‘armed’ the movements of national liberation? The USSR, including support for the Palestinians during most of its history. Nevertheless, Stalin’s description of the West’s prerogative for post-war hegemony based on the belief in its primacy has many overlaps with the idea that the Occident exercised patronizing dominance over the East. Today, even though the Berlin Wall has long since fallen and Eastern Europe is under free enterprise, the political establishment in the West is still clinging to this attitude and misunderstanding of Moscow to fulfill its need for a permanent global nemesis with a desire to eventually colonize Russia with foreign capital as it did under Boris Yeltsin. Russia has historically possessed a unique and ambivalent identity located between the East and West, having been invaded by both European and Asian empires in previous centuries. Said included Russia in Orientalism in his analysis of European countries and their attitude toward the East, but did not note that Russia is in many respects the Orient within the Occident, as more than 75% of its territory as the largest nation in the world is actually located in Asia while three quarters of its population live on the European side. Russia may be partly European, but it is certainly not Western. Then again, Europe is not a continent unto itself but geographically connected to Asia with the arbitrary division between them based on cultural differences, not landmass, where Russia is an intermediate. Expansionism under Peter the Great may have brought Western European ‘cultural values’ and modernization to Russia, but the majority of its territory itself remains in Asia. Even after the presumed end of the Cold War, Russia has been excluded from the European Union and instead joined the Shanghai Cooperation Organization (SCO), while developing strong ties with China. As recently disclosed documents from the National Security Archive prove, NATO has broken its promise to Mikhail Gorbachev during the George H.W. Bush administration that it not expand eastward following Germany’s enrollment. It has since added 13 countries since 1999, 10 of which were former Warsaw Pact states. Russia’s alliance with China has been solidified precisely because it is still not treated in the same regard as other European nations even after the adoption of a private sector economy. In order to justify its continued armament and avoid obsolescence, NATO has manufactured an adversarial relationship with Moscow. Contrary to the widespread perception of his rhetoric, in terms of policy-making President Trump has been equally as hostile to Moscow as his predecessors, if not more so in light of the U.S. withdrawal from the Intermediate-Range Nuclear Forces Treaty (INF). What the usual suspects behind the attempted soft-coup against him fail to understand is that Trump’s tact toward Putin is more likely an inverted version of the ‘only Nixon could go to China’ strategy, an unexpected style of diplomacy based on the pragmatic objective of containing Beijing by dividing America’s two primary foes. The liberals still in denial about their election defeat continue to underestimate Trump, but the Chinese are not fooled. The architect behind Nixon’s détente with Mao, Henry Kissinger, is even believed to have encouraged Trump to ease tensions with Moscow in order to quarantine China and don’t think they haven’t noticed. Ultimately, the divide between Trump and his enemies in the establishment is really a disagreement over strategy in how to surround China and prevent the inevitable downfall of the U.S. empire. The ongoing demonization of Moscow is ultimately about China as well. It was only a matter of time until the uncertain allegations of election interference were also leveled against Beijing without proof as a Joint Statement from the U.S. intelligence agencies recently showed. Make no mistake - underneath the West’s Russophobia lies Sinophobia and as Washington’s real geopolitical challenger, China will in due course emerge as the preferred bogeyman. The bipartisan hawkishness has created an environment where rapprochement and diplomacy of any kind is seen as weakness and even a sign of treason, making the prospect of peace seemingly impossible. As China continues to grow, it will find itself more squarely in the crosshairs of imperialism, regardless of whether Trump’s strategy to renew relations with Moscow against Beijing is successful. Until then cooler heads at the highest levels of government must prevail as they thankfully did at the height of the first Cold War for the sake of peace between Russia, the U.S. and the entire world.